Diamonds are forever. Keep time in style with 12 genuine diamond accents. Scents for Every Mom. Is your Mom romantic, elegant or captivating? Make mom feel special this Mother's Day with fragrance gifts that express her personality. Mother's Day is May 8th! Made with Love. On pages 148-149 Celebrate Mother's Day with great gifts that are perfect for the mom who loves her tight-knit family! Clearance Sale starting on page 152. Calling all sale lovers. Tons of amazing deals on fashion, jewelry, beauty and more! Get these hot bargains before they're gone! The Big Spring Makeup Sale starting on page 8. Stock up on all your faves or try something new. With hundreds of items to choose from, now's the time to get it all! I love our Sterling Silver jewelry and the You are My Sunshine Necklace is no exception. 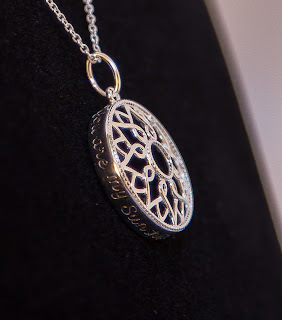 The pendent design is the perfect combination of hearts and sun and the inscription around the outside is from a song I often find myself humming. 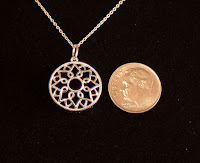 The photo in the brochure is enlarged to show the detail which makes it look to be about the size of a quarter, but it is more delicate and more the size of a dime as pictured here. We did enlarge it a bit though to show the engraving on the size. From time to time a product line will be discontinued that leaves behind many disappointed fans of that product. One of those product lines was Planet Spa, our line of at-home spa collections inspired by luxurious beauty rituals from around the world and I was one of the many fans who have missed it. 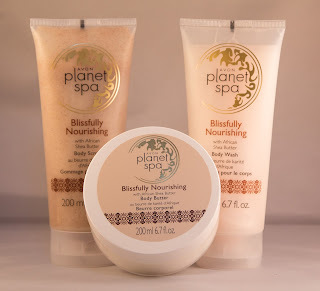 My favorite Planet Spa products were the African Shea Butter Body Scrub and Body Butter. Not only does it smell wonderful, it's a blend of macadamia nut, vanilla and caramel, but it leaves my skin feeling amazing. The scrub gently massages away any rough skin and leave my skin ready to soak in the rich creamy body butter. For those times when I don't want to use a scrub, the body wash produces a rich, creamy lather that moisturizes as it cleanses so I don't need as much lotion. In Campaign 10 Avon introduces our first Triple Threat Mascara. With Big & Multiplied Mascara you can achieve the ultimate look in lash fullness with the Multiplier Brush which combines brush and comb zones to instantly separate and volumize lashes. Designed with smart slip technology, the mascara sticks to lashes, not to itself. See the full line of Avon Mascaras with tips for choosing the best one for you here. Check out the Celebrate the Moment and Mother's Day flyers for even more special deals on makeup, fragrance, jewelry, and personal care.